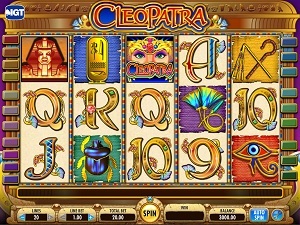 Cleopatra is an online video slot machine game launched in October 2006 and is offered exclusively at online casinos powered by IGT (International Game Technology). This video slot game has 5 reels and 20 pay lines. The theme of Cleopatra is, of course, about Cleopatra herself and some representations of Ancient Egypt. Cleopatra is considered to be one of the most popular IGT games in the world! If you have been a long-time online slot player, you will surely notice that there are a lot of slots games that feature Ancient Egypt as their theme. Most online slots players, if they find out that a certain slot game has just been released and its theme is inspired by ancient Egypt, they would say, “Oh no, not another Egyptian slots game!” If you think like this too, why not take a look for yourself, and for sure you will definitely change your mind that Egyptian Heroes is “not just another Egyptian slot game”. Keep in mind that Cleopatra is one of the most popular slot games all around the world, so it is really worth it to take a look and play this slot machine game for a while! In an Egyptian historical point of view, Cleopatra was regarded as a great beauty and most people concur that she possessed the wit, the charm, the sweetest voice and she knew how to make herself agreeable to everyone. In the Cleopatra online slot game, the level of bets provide a great variety – the minimum bet per line is just 0.10 and the maximum is 10. This is what probably made Cleopatra popular among a broad range of slots players because some can fine tune their bets, while others can tweak the number of lines from 1 to 20 per spin. Players are given the choice to play with a bet of as low as 0.10 per spin or as high as £/$/€500 per spin! Top that with an appealing Free Spin Bonus Feature game that triples all winning combinations, scatter wins, and wild symbols that multiplies (x2) the payouts – you will surely be entranced to play the Cleopatra online slots game! Online slots games are very interesting to play at once you have got a taste of its free play mode, and that is what’s great about IGT as they allow interested players to play instantly on any of their online slot games, without requiring them to download. Every person who plays slot games will surely know about the ever-famous Cleopatra slot game, because it features wild multiplier symbols, scatter wins, a Free Spin bonus game with a generous 3x multiplier, a maximum coin jackpot of 10,000, a maximum cash jackpot of £50,000, and last but not least, it has a 95.02% theoretical average RTP (return to player)! Considered to be one of the best-performing classic slot games in the world of land-based slots games, Cleopatra (its online slot game version) is proudly brought to you by IGT. As for its background setting, Cleopatra has an Egyptian museum-like ambience that features popular icons, Cleopatra herself, and everything else that represents ancient Egypt. The symbols are drawn simply but intricately, and you will certainly love its animated programming whenever you hit winning combinations, most especially when you hit the Sphinx scatter symbol that transports you to the Cleopatra Free Spin Bonus Feature game. The overall graphic design of Cleopatra showcases a wide array of vibrant colors such as red, orange, yellow, purple, gray, blue, green, and of course, brown and gold. When you spin the reels, Egyptian-themed music will be played out. The vibrantly-colored card deck symbols and Egyptian symbols included in the Cleopatra online video slot game are greatly matched by different kinds of entertaining Egyptian-inspired sound effects whenever you get a winning combination. Once you trigger the Cleopatra Free Spin Bonus Feature game, you will hear Cleopatra saying “It’s time for 15 Free Spins”, and fast-paced Egyptian-themed background music will be played, which makes the player feel more anticipation as the Free Spins automatically play out and help them win some cool prizes! The regular symbols are the card deck symbols which are 9, 10, J, Q, K and Ace, designed in an Egyptian-like style; and the other symbols that you will see in the Cleopatra online video slot game are the Scarab, the Lotus Carving, the Gold Pendant, the Crook and Flail, and the Eye of Horus. The Wild Symbol is the Cleopatra symbol. The Cleopatra wild symbol acts as a substitute for all other symbols (with the exception of the scatter symbol), and it also acts as a Wild Multiplier, which means it can multiply the payout. The Cleopatra wild symbol doubles (multiplier x2) the payout of every winning combination it completes, as long as it functions as a substitute symbol. When you are able to get winning combinations with multiple Cleopatra wild symbols on an active pay line, you will be given varying prizes (refer to the Paytable). Please take note that the Cleopatra wild symbol winning combination payouts are not doubled. The Scatter Symbol is the Sphinx. The Scatter symbol (Sphinx) does not need to come out in a line on an enabled pay line for you to win. The Sphinx scatter symbol can be found scattered anywhere on the 5 reels, and you will be able to complete winning combinations as long as 2 or more Sphinx scatter symbols come out in a single spin. The winnings are calculated by multiplying the Sphinx scatter symbol combination payout (shown in the Paytable) by the total number of coins you’ve bet. If you hit 3 or more Sphinx scatter symbols, you will activate the Free Spin bonus game. Please take note that if you obtain a scatter win and a regular win, you are then paid out for both of these winnings, because the Sphinx scatter symbol is not required to come out on an enabled pay line for you to win. Scatter wins are included to the pay line wins. Cleopatra Free Spin Bonus Feature Game – If you manage to hit 3 or more Sphinx scatter symbols (that can be found anywhere on the 5 reels), you will activate the Cleopatra Free Spin Bonus Feature game. Initially, you are awarded 15 Free Spins, and all of the winning combinations that you will get with the use of these 15 Free Spins will be tripled (multiplier x3)! But, of course, with the exception of 5 Cleopatra wild symbols. While playing the Free Spin game and you happen to get 3 or more Sphinx scatter symbols, you are awarded another set of 15 Free Spins! The additional Free Spins are included to your remaining number of Free Spins. The Cleopatra Free Spin Bonus Feature game will end when there are no more Free Spins remaining, or when you reach the maximum number of 180 Free Spins. Please take note that all of the bets and pay lines played in the Free Spins are exactly the same as the spin that triggered the Cleopatra Free Spin Bonus Feature game. When the Cleopatra Free Spin Bonus Feature game is over, you will be taken back to the main Cleopatra online video slot game, and your winnings acquired from the Free Spin games are included to your overall balance. Cleopatra has 5 reels where you may bet on as many as 20 pay lines. The minimum bet is 0.01 and the maximum bet is 10.00. You can wager from 1 up to 5 coins per pay line bet. It is absolutely more fun and easy when there is an Autoplay function available in online slot games. In Cleopatra, you can access their Autoplay function by clicking on the (red) Autoplay button on the lower right corner of the screen (next to the Paytable). You are given the choice of how many spins you would like the game to do automatically for you – from as low as 5 up to as high as 25. When you choose a number, say 10, the Autoplay function will keep track of the remaining number of automatic spins. You are actually given the option to stop the Autoplay as well, just in case you want to.